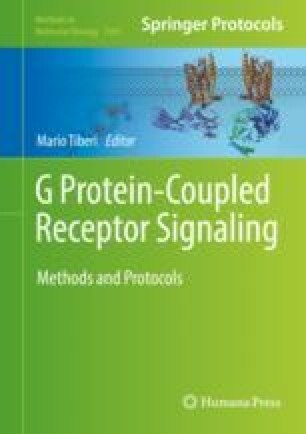 Intracellular signal transduced by G protein-coupled receptors (GPCRs) is tightly controlled by a guanine nucleotide-binding complex made of G protein Gα, Gβ, and Gγ subunits, as well as a growing array of regulatory and accessory proteins such as arrestins. G protein-independent β-arrestin recruitment at GPCRs is universally accepted as the canonical interactor system and it has been found to be a powerful tracker of most GPCRs activation. Pharmacological concepts have evolved remarkably after the finding that different ligands, binding at the same receptor, can selectively activate specific subsets of signaling pathways among all pathways activated by balanced ligands. This new paradigm referred to as functional selectivity or biased signaling, has opened new avenues for the design of tailored drugs with enhanced therapeutic efficacies and reduced side effects. Here, we describe a unique platform for the interrogation of GPCR using a transcriptional-based assay to measure transient β-arrestin recruitment called Tango. This work was supported by the Canadian Institutes of Health Research MOP142219.